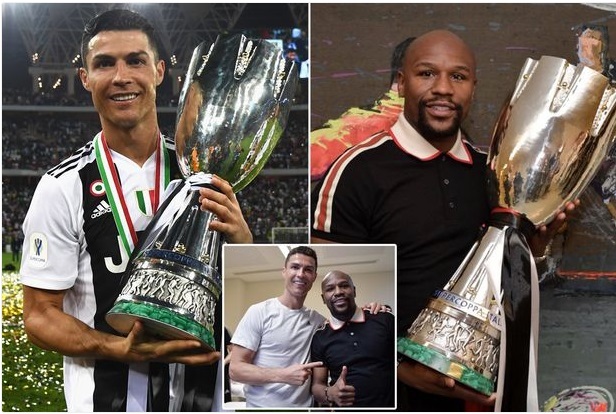 Cristiano Ronaldo and his Juventus teammates celebrated their Italian Super Cup success with Floyd Mayweather after their 1-0 defeat of AC Milan. Portugal superstar Ronaldo scored the only goal of the game in Jeddah, Saudi Arabia – where the match had controversially been staged. Ronaldo and his Juve teammates were congratulated in the dressing room by unbeaten boxing star Mayweather. Speaking post-game, Ronaldo told Rai Sport: “It was a very difficult match, it’s very warm and hard to play in these conditions. Juve currently sit nine points clear of second place Napoli in Serie A, having gone unbeaten in the first half of the season. They are also Champions League contenders and are set to face Atletico Madrid in the second round, as they bid to end their 23-year wait for the European Cup.